Update – February 2017: Since this post was originally written in January 2016, there have been a lot of developments in the world of R when it comes to Google Analytics. Most notably, the googleAnalyticsR package was released. 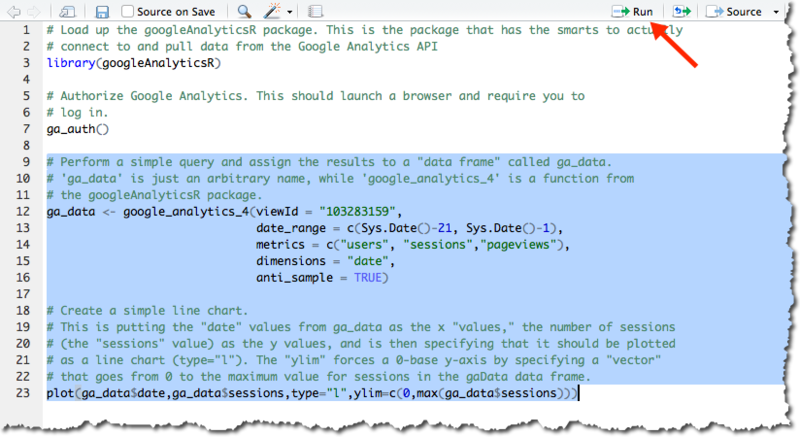 That package makes a number of aspects of using R with Google Analytics quite a bit easier, and it takes advantage of the v4 API for Google Analytics. As such, this post has been updated to use this new package. In addition, in the fall of 2016, dartistics.com was created — a site dedicated to using R for digital analytics. The Google Analytics API page on that site is, in some ways, redundant with this post. I’ve updated this post to use the googleAnalyticsR package and, overall, to be a bit more streamlined. R is like a bicycle. 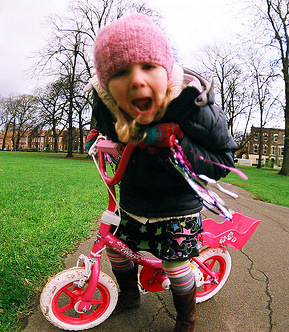 Or, rather, learning R is like learning to ride a bicycle. Someone once pointed out to me how hard it is to explain to someone how to ride a bicycle once you’ve learned to ride yourself. That observation has stuck with me for years, as it applies to many learned skills in life. It can be incredibly frustrating (but then rewarding) to get from “not riding” to “riding.” But, then, once you’re riding, it’s incredibly hard to articulate exactly what clicked that made it happen so that you can teach someone else how to ride. I’m starting to think, for digital analysts who didn’t come from a development background, learning R can be a lot like riding a bike: plenty of non-dev-background analysts have done it…but they’ve largely transitioned to dev-speak once they’ve made that leap, and that makes it challenging for them to help other analysts hop on the R bicycle. This post is an attempt to get from “your parents just came home with your first bike” to “you pedaled, unassisted, for 50 feet in a straight line” as quickly as possible when it comes to R. My hope is that, within an hour or two, with this post as your guide, you can see your Google Analytics data inside of RStudio. If you do, you’ll actually be through a bunch of the one-time stuff, and you can start tinkering with the tool to actually put it to applied use. This post is written as five steps, and Step 1 and Step 2 are totally one-time things. Step 3 is possibly one-time, too, depending on how many sites you work on. Why Mess with R, Anyway? It’s a tool designed to handle very granular/atomic data, and to handle it fairly efficiently. It’s shareable/replicable — rather than needing to document how you exported the data, then how you adjusted it and cleaned it, you actually have the steps fully “scripted;” they can be reliably repeated week in and week out, and shared from analyst to analyst. As an open source platform geared towards analytics, it has endless add-ons (“packages”) for performing complex and powerful operations. As a data visualization platform, it’s more flexible than Excel (and, it can do things like build a simple histogram with 7 bars from a million individual data points…without the intermediate aggregation that Excel would require). It’s a platform that inherently supports pulling together diverse data sets fairly easily (via APIs or import). It’s “scriptable” — so it can be “programmed” to quickly combine, clean, and visualize data from multiple sources in a highly repeatable manner. It’s interactive — so it can also be used to manipulate and explore data on the fly. That list, I realize, is awfully “feature”-oriented. But, as I look at how the role of analytics in organizations is evolving, these seem like features that we increasingly need at our disposal. The data we’re dealing with is getting larger and more complex, which means it both opens up new opportunities for what we can do with it, and it requires more care in how the fruits of that labor get visualized and presented. If you need more convincing, check out Episode #019 of the Digital Analytics Power Hour podcast with Eric Goldsmith — that discussion was the single biggest motivator for why I spent a good chunk of the holiday lull digging back into R.
Jason Packer is the founder of Quantable Consulting — you can find him on LinkedIn or Twitter… or posting in-depth research and experiments on the Quantable blog. Tom Miller is the VP of Research and Analytics at Digital Surgeons — you can find him on LinkedIn or Twitter, too, and he may even write a follow-up to this post on his blog. Jason and Tom are both cruising pretty comfortably around town on their R bikes and will even try an occasional wheelie. Their vetting and input shored up the content in this post considerably. This is an attempt to be the bare minimum for someone to get their own Google Analytics data coming into RStudio via the Google Analytics API. It’s got bare minimum explanations of what’s going on at each step (partly to keep from tangents; partly because I’m not equipped to go into a ton of detail). If you’re trying to go from “got the bike” (and R and RStudio are free, so they’re giving bikes away) to that first unassisted trip down the street, and you use this post to do so, please leave a comment as to if/where you got tripped up. I’ll be monitoring the comments and revising the post as warranted to make it better for the next analyst. I’m by no means the first person to attempt this (see this post by Kushan Shah and this post by Richard Fergie and this post by Google… and now this page on dartistics.com and this page on the googleAnalyticsR site). I’m penning this post as my own entry in that particular canon. Install R — this is, well, R. Ya’ gotta have it. Now, if you’ve made it this far and are literally starting from scratch, you will have noticed something: there are a lot of text descriptions in this world! How long has it been since you’ve needed to download and install something? And…wow!… there are a lot of options for exactly which is the right one to install! That’s a glimpse into the world we’re diving into here. You won’t need to be making platform choices right and left — the R script that I write using my Mac is going to run just fine on your Windows machine* — but the world of R (the world of development) sure has a lot of text, and a lot of that text sometimes looks like it’s in a pseudo-language. Hang in there! * This isn’t entirely true…but it’s true enough for now. If the previous step is our way to enable R to actually prompt you to authenticate, this step is actually about pointing R to the specific Google Analytics view we’re going to use. There are many ways to do this, but a key here is that the view ID is not the Google Analytics Property ID. You’ll need to record this ID somewhere (or, again, just leave the browser tab open while you’re building your script in a couple of steps). 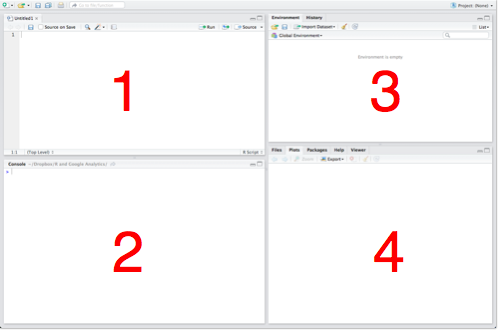 It’s worth hitting on each of these four panes briefly as a way to get a super-basic understanding of some things that are unique when it comes to working with R. For each of the four areas described below, you can insert, “…and much, much more” at the end. Pane 1: Source (this pane might not actually appear — Pane 2 may be full height; don’t worry about that; we’ll have Pane 1 soon enough!) — this is an area where you can both view data and, more importantly (for now), view and edit files. There’s lots that happens (or can happen) here, but the way we’re going to use it in this post is to work on an R script that we can edit, run, and save. We’ll also use it to view a table of our data. Pane 2: Console — this is, essentially, the “what’s happening now” view. But, it is also where we can actually enter R commands one by one. We’ll get to that at the very end of this post. Pane 3: Environment/Workspace/History — this keeps a running log of the variables and values that are currently “in memory.” That can wind up being a lot of stuff. It’s handy for some aspects of debugging, and we’ll use it to view our data when we pull it. Basically, RStudio persists data structures, plots, and a running history of your console output into a collection called a “Project.” This makes organizing working projects and switching between them very simple (once you’ve gotten comfortable with the construct). It also supports code editing, in that you can work on a dataset in memory without continually rerunning the code to pull that data in. Pane 4: Files/Plots/Packages/Help — this is where we’re actually going to plot our data. But, it’s also where help content shows up, and it’s where you can manually load/unload various “packages” (which we’ll also get to in a bit). 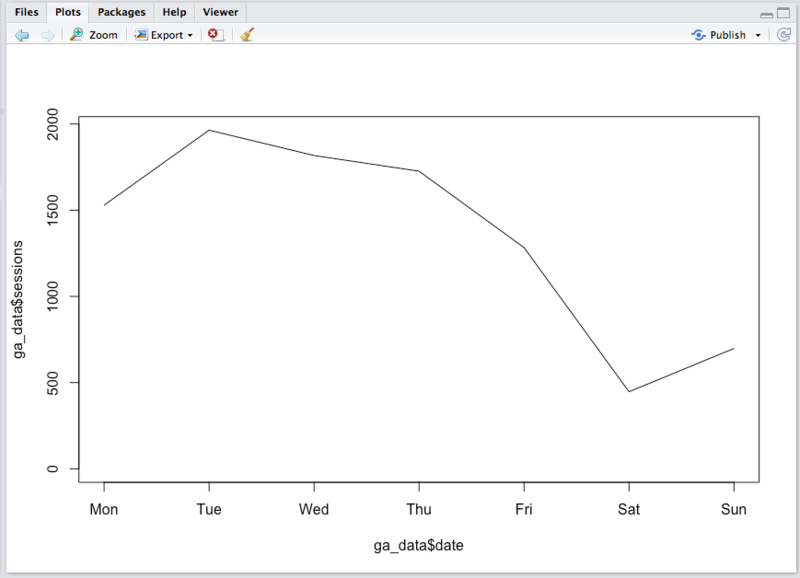 There is a more in-depth description of the RStudio panes here, which is worth taking a look into once you start digging into the platform more. For now, let’s stay focused. If you enter three consecutive commands in the console, and that does what you want, you can simply copy and paste those three lines from the console into a file, and you’re set to re-run them whenever you want. Semi-conversely, when working with a file (Pane 1), it’s not an “all or nothing” execution. You can simply highlight the portion of the code you want to run, and that is all that runs. So, in essence, you’re entering a sequence of commands in the console. Still confusing? File it away for now. The seed has been planted. The nice thing about packages is that they tend to be available through the CRAN repository…which means you don’t have to go and find them and download and install them. You can simply download/load them with simple commands in your R script! It will even install any packages that are required by the package you’re asking for if you don’t have those dependencies already (many packages actually rely on other packages as building blocks, which makes sense — that capability enables the developer of a new package to stand on the shoulders of those who have come before, which winds up making for some extremely powerful packages). VERY handy. One other note about packages. We’re going to use the standard visualization functions built into R’s core in this post. You’ll quickly find that most people use the ‘ggplot2’ package once they get into heavy visualization. Tom Miller actually wrote a follow-on post to this blog post where he does some additional visualizations of the data set with ggplot2. I’m nowhere near cracking that nut, so we’re going to stick with the basics here. Step 5: Finally! Let’s Do Some R! That’s largely a one-time operation. That package will stay installed. You can also install packages from within a script… but there’s no need to keep re-installing it. So, at most, down the road, you may want to have a separate script that just installs the various packages you use that you can run if/when you ever have a need to re-install. Go to this page on Github, highlight the 23 lines of code and then copy it with <Ctrl>-C or <Cmd>-C. Inside RStudio, select File >> New File >> R Script, and then paste the code you just copied into the script pane (Pane 1 from the diagram above). You should see something that looks like the screen below (except for the red box — that will say “[view ID]”). Replace the and [view ID] with the view ID you’d found earlier.. Throw some salt over your left shoulder. Say a brief prayer to any Higher Power with which you have a relationship. Click on the word Source at the top right of the Pane 1 (or press <Ctrl>-<Shift>-<Enter>) to execute the code. With luck, you’ll be popped over to your web browser and requested to allow access to your Google Analytics data. Allow it! This is just allowing access to the script you’re running locally on your computer — nothing else! If you got an error…then you need to troubleshoot. Leave a comment and we’ll build up a little string of what sorts of errors can happen and how to address them. One other thing to take a look at is the data itself. Keep in mind that you ran the script, so the data got created and is actually sitting in memory. It’s actually sitting in a “data frame” called ga_data. So, let’s hop over to Pane 3 and click on ga_data in the Environment tab. Voila! A data table of our query shows up in Pane 1 in a new tab! A brief word on data frames: The data frame is one of the most important data structure within R. Think of data frames as being database tables. A lot of the work in R is manipulating data within data frames, and some of the most popular R packages were made to help R users manage data in data frames. The good news is that R has a lot of baked-in “syntactic sugar” made to make this data manipulation easier once you’re comfortable with it. Remember, R was written by data geeks, for data geeks! I’m actually not going to dig into the details here as to how the code actually works. I commented the script file pretty extensively (a “#” at the beginning of a line is a comment — those lines aren’t for the code to execute). I’ve tried to make it as simple as possible, which then sets you up to start fiddling around with little settings here and there to get comfortable with the basics. 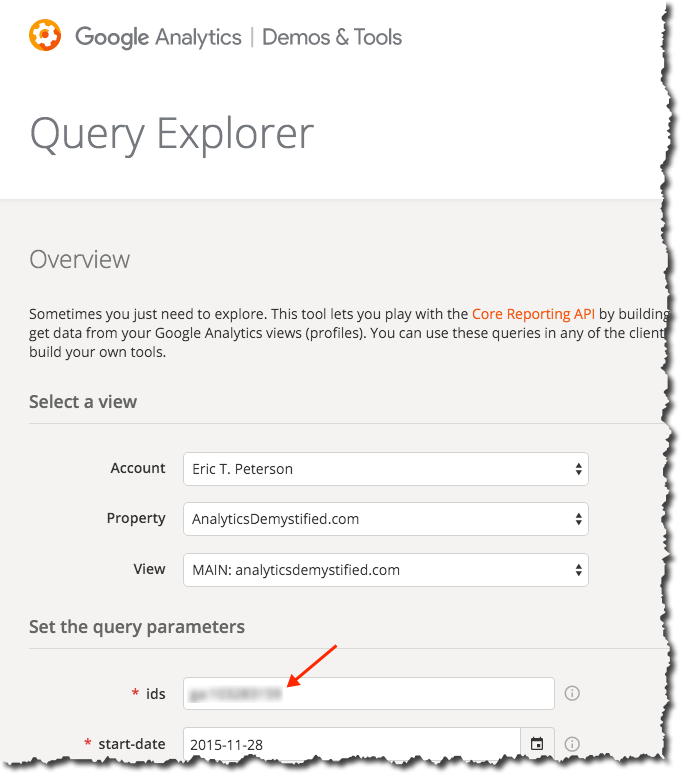 To fiddle around with the get_ga() settings, you’ll likely want to refer to the multitude of Google Analytics dimensions and metrics that are available through the core reporting API. Then, you can click the Run button at the top of the script to re-run it (or press <Ctrl>-<Enter>). Highlight and copy the last line (row 23) in the script. Paste it next to the “>” in the console. Change the two occurrences of “sessions” to be “pageviews”. The plot in Pane 4 should now show pageviews instead of sessions. In the console, you can actually read up on the plot() function by typing ?plot. The Help tab in Pane 4 will open up with the function’s help file. You can also get to the same help information by pressing F1 in either the source (Pane 1) or console (Pane 2) panes. This will pull up help for whatever function your cursor is currently on. If not from the embedded help, then from Googling, you can experiment with the plot — adding a title, changing the labels, changing the color of the line, adding markers for each data point. All of this can be done in the console. When you’ve got a plot you like, you can copy and paste it back into the script file in Pane 1 and save the file! And, please…PLEASE… take a minute or two to leave a comment here. If you got tripped up, and you got yourself untripped (or didn’t), a comment will help others. I’ll be keeping an eye on the comments and will update the post as warranted, as well as will chime in — or get someone more knowledgeable than I am to chime in — to help you out. 1. This is fantastic. I can’t wait to dive in. 2. I got a prompt to “Enter authorization code” after I followed your steps. Maybe I didn’t throw enough salt? Yep. I think you skimped on the salt. Did a browser window pop open asking you to authenticate/allow access to Google? I’m getting the same error message as Andrew. No browser window opened; “Enter authorization code:” came as a line in the console. If you copy & paste that URL you should get the authorization code. Ok, @Jason, that was it. I pasted the link, got the code and it worked. Thanks! I got the same as below, but also after succesfully entering the auth code, I got this error: “unused arguments (profile.id ..”, is the view id supposed to be with a preceding “ga:” or just the number? Could it be throwing the error because it’s a test analytics view? First I had the same problem as Andrew. Overcame that, but now stuck with the same error as Tomislav. The procedure in step 2 started for me different than explained. Google wanted me to define a project first. Oops. It does look like Step 2 prompts to create a project first — I missed that. I’ll get the post updated, but want to get to the bottom of the issue first to see if I’ve got other information that needs to be updated. Starting with the easy approach — including “ga:” and removing the “[ ]”… Any chance one of those was the issue? Hi Tim, tried with ga: and without. Brackets I am not sure. Will try later without brackets. They changed the syntax needed for RGA. But I am unsure whether I want this bike anymore. For a non-coder the whole process seems soo cumbersome. Hi thank you for the tutorial, I’m having som issues fetching the data, Im getting Timeout errors after authenicating. User error, bad proxy settings. Thanks, Arthur! Nice sleuthing. I’ve updated the post to use the newer version of RGA (which changed profile.id to profileId and sampling.level to samplingLevel), as well as to show the steps for when a new project has to be created in the Google Developers Console. As for whether or not it’s a bike worth riding… the fact that you tracked down and interpreted the Github post is an indication that it *could* be a bike you could ride. What struck me in this exercise was that a *lot* of the work in this post is essentially “one-time” work. Tinkering with the query winds up being pretty easy, and then the post that Tom Miller wrote digs into the visualization a bit more. There is definitely a chunk of effort in the initial setup, and then a steep learning curve (and I have by no means completed my journey up that curve). But, once you’re there, I’m already seeing the value of having re-usable scripts to pull/cleanse/manipulate the data, as well as to pull data from multiple sources (I also just added a link to Ryan Praskievicz’s post on pulling Google Search Console data in with R), seems like it opens up some really promising possibilities. Is it possible you’re behind a firewall that could be causing issues? I found this thread: https://github.com/hadley/devtools/issues/877 (any time you see “hadley” write something, treat it as the voice of God). “httr” is a package that RGA uses to actually make the call to GA to get the data. As a side note, I just updated this post based on other comments to address the newer version of RGA (0.4.1). That affected the script syntax slightly. I don’t think that is directly related to the issue you’re seeing, but it seemed worth mentioning in the event you run into that snag, too. Thanks guys, will try it! What should I do or any reccomendations? Thank you for your help and the post! Are you running RStudio Server and connecting to it through your browser then? Sounds like that might be the case, definitely the easiest fix is to run it from your desktop if you can. When you get that error what is the URL in your browser? If it is like localhost:… then the problem is that the authentication can’t complete because the redirect URL is failing since you are not actually running your R server on localhost. Thank you for this tutorial. Good to read what you said about the R Course on Coursera. I think it was a waste. I will check out your other recommendations. But yes, I was running from a server, and your script worked great once ran from a desktop! Dear Bendik, could you solve the problem already? Can you please share Your solution? Dear 葉家豪, could you solve the problem already? Can you please share Your solution? I still can’t solve it but I use another way. I use other computer to take the token and the computer of work just need to load(“token”). Hi Tim, thanks for this post, its all up excellent, and the only one I’ve found online that solved my problem of accessing GA via R.
The key step that all the other “how to” posts miss is opening Query Explorer and allowing access through there. Until I did that, <-authorization kept giving me a 401. Thank you so much for this post, EXACTLY what I was looking for. Very easy to follow. Just ran the tutorial successfully, tripped at the authentication after running the demo file. Turns out the answer was provided in the console, which in my glee I neglected to note down. Essentially I went to my Google API dashboard and enabled access, the link was provided in the console as well. I’ve requested to join the slack group, looking forward to delving deeper, but chances are right now I’m going to brush up on foundation knowledge like algebra and programming and stats. Long road ahead! Can you be more specific as to where you got tripped up and how you addressed it? Was it in Step 2? I’d like to update the post to call it out if it’s something others are likely to miss as well. I tripped at STEP 5: FINALLY! LET’S DO SOME R! : 7. Click on the word Source at the top right of the Pane 1 (or press –) to execute the code. The script failed to run after I added my [Client ID], [Client Secret] & [View ID]. In the console was mentioned that likely I had to enable access to the data. Also in the console next to the error message there was the URL with the fix which simply took me to the Google API page to get it sorted, which I did in one click. Sorry I can’t provide more info/screencap since I’ve already authenticated all my properties, and so can’t reproduce the first error. This was extremely helpful. Thanks for taking the time to write it. I ran into one hitch with authentication. After creating credentials in Google Developers, I had to go back and enable. Easy fix. The prompt was given via the command line in the tool with the URL. Is there a way to get R to just download all Google Analytics metrics for the date range, rather than a subset that I specify? Yes and no. I really need to update this post, as I’ve been using googleAnalyticsR as my package of choice, which makes a lot of the initial setup way simpler (and has other benefits): http://code.markedmondson.me/googleAnalyticsR/index.html. But, to your question, with either package, this would take a little setup, but would then be doable. 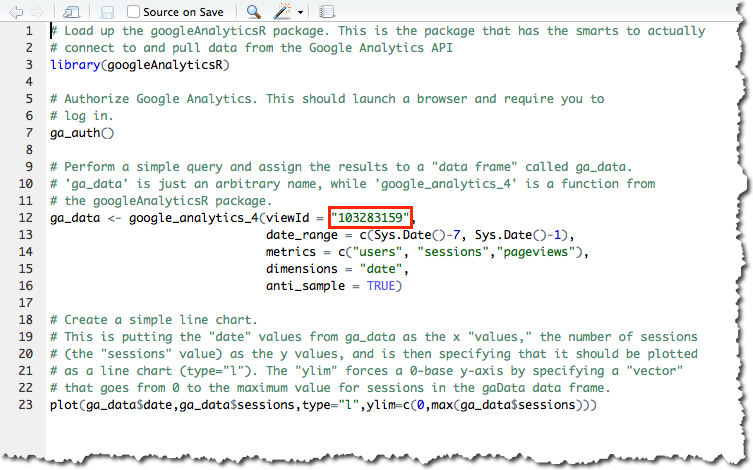 I don’t think the Google Analytics API has a “get all metrics” call, so you’d need to build that list — starting with something like: https://developers.google.com/analytics/devguides/reporting/core/dimsmets. Some of those metrics probably don’t make much sense in aggregate, so it’s probably a worthwhile exercise. And, if custom metrics are used, then you’d need to include those in your list. So, that would (could) give you one vector with all of the metrics. I suspect there is a limit to how many metrics you can return at once through the API, so you may have to then chunk that up into a few calls. What’s the use case? It seems like something that would be pretty easy to do and could then be posted on Github for others (I’m loosely volunteering, although without a deadline commitment!). I primarily use Google Analytics to track paid search efforts. The initial use case would be to provide calculated metrics for large eCommerce sites. We currently enter a bunch of metrics manually into ever growing excel spreadsheets that have a summary metric page on the front. Future use would be for prediction and A/B/Multivariate testing. Well… this was the comment that finally got me to get off my a** and update this post. You’ll see that Step 2 is now… not a step. Hopefully, the explanation there makes sense. Unless you absolutely need to set up your own Google Developer Project API credentials for some other reason, you can probably skip it. This was awesome Tim. Thank you for this. So far I have learned how to create trending graphs with ggplot for both AA and GA, and am likely onto shiny apps next. Setting up oAuth 2.0 with my google API project I setup was a bit more work, but I still managed to get all of this accomplished in less than a few hours between GA and AA. Thank you for sharing this content and your shortcomings along the way. A lot of lessons learned I feel like saved us all tens of hours on this content! Works like a charm for me. Thanks for the time and effort. Appreciate! That’s great! If you want some quick, standalone examples to try out, check out http://dartistics.com/googleanalytics. That’s new content that we’re hoping to flesh out quite a bit, but I’m hoping it’s a good “next step” from this post. After installing the curl package everything worked fine. Thanks for the tutorial, it’s going to be really helpful to our business. Hmmm. That’s interesting. Each R package should install all the dependent packages. If you’re up for it, you could add an issue at https://github.com/MarkEdmondson1234/googleAnalyticsR/issues to let Mark know. It may be a small oversight with the package (or it may be an issue with something in the steps here; either way, it would be good to know). I want the same thing in R language. Please can anyone guide me. Am very desperate right now to get the output.